EasyCart is a complex eCommerce software, and working with eCommerce requires many more server configurations to be accurately working than a regular WordPress website. eCommerce requires server emailer systems to work, server sessions, PHP configurations, communication modules, and many more features to be accurately setup at the server hosting level. Often, in a shared web hosting environment, these settings can vary greatly from account to account. 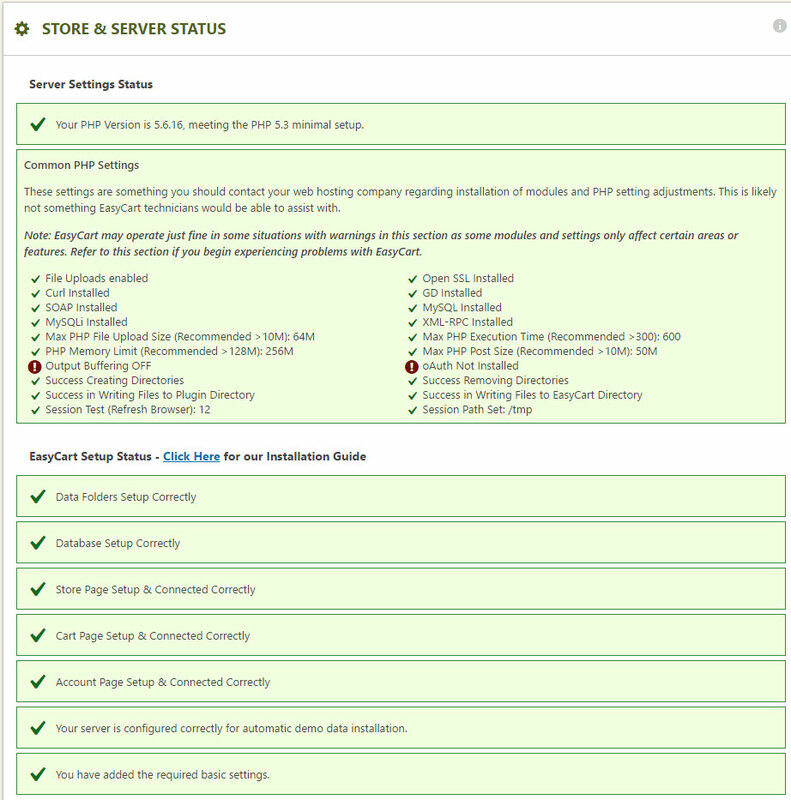 Godaddy, hostgator, bluehost, wpengine, and many other hosts all configure differently. We have created this store status section to quickly and easily check a host of various settings all from one location. This page does not test every facet of your hosting environment, but we can detect some obvious settings within hosting or EasyCart that need correcting. EasyCart tries to check and indicate if a setting or setup is missing or misconfigured. Not all issues may effect your specific EasyCart and it may depend on certain features you use or do not use. Server settings will need to be shown to your web host provider and worked out there, while EasyCart settings can indicate you need to tackle a setup or setting somewhere.